Remembering passwords can be a headache; instead, why not log into your computer with a scan of your eye? The hardware and software to make iris scanning a key feature is now reaching smartphones and PCs. The process is simple: An infrared scanner on a device will scan your iris, and verify its authenticity against encrypted information stored on the device. It's a notable feature in Samsung's Galaxy Note7 smartphone, which was announced on Tuesday. 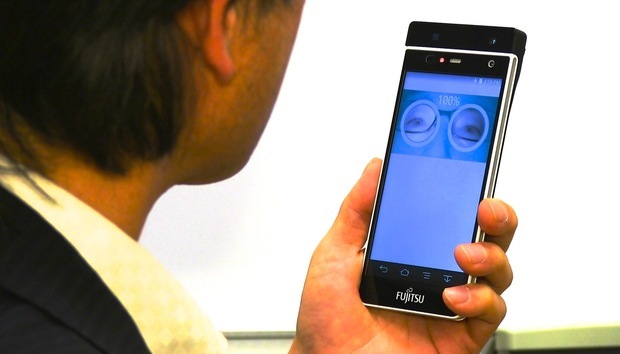 The smartphone has an iris scanner -- used to log in -- on top of its screen. There's an uneasy feeling about the flash of light projected into your eye, but experts believe iris scanning is a more secure form of biometric authentication than fingerprints. The Galaxy Note7 isn't the first smartphone with the capability. Fujitsu's Arrows NX F-04G and Microsoft's Lumia 950 XL were both released last year. Iris scanners will likely reach Apple's phones in 2018, said Asem Othman, a biometric scientist at Hoyos Labs. Microsoft is moving toward iris scanning as a way to log into Windows 10 PCs and smartphones as part of its Windows Hello biometric authentication system. Microsoft's goal is to kill passwords with Windows Hello, which also offers fingerprint scanning and pattern authentication. Iris scanning has been used for years to verify identities, most notably at airports. But it has shortcomings. It can't be used as a verification feature for the blind or people with cataracts, and bad lighting, or interference from things like eyelashes, could lead to wrong results, according to the SANS Institute. The iris is behind the eye's cornea and in front of the lens, and responsible for controlling the amount of light reaching the retina. It is the only internal organ readily visible from the outside of a person, Othman said. "Unlike fingerprints, capturing the iris biometric is like taking a picture, and facial expressions and aging effects cannot easily alter its pattern,” Othman said. Iris scanning is first appearing in premium smartphones. It could be expensive to put the NIR (near-infrared) lighting and sensors needed for iris scanning in budget smartphones, partly because the technology is new. A smartphone with the feature also requires a powerful processor. "I think due to size and price limitation, adding this sensor to phones requires time," Othman said. Sensor manufacturers will need to build more suitable ones for smaller budget phones, he added. Acceptance of the technology is also a matter of making eye scanning palatable for regular users. Apple made fingerprint readers a trend with Touch ID, which can be used to log into an iPhone or make payments. Samsung is working with companies like Bank of America to integrate iris scanning into the mobile banking experience via Note7. It remains to be seen if iris scanning integrates effectively into other mobile applications, and whether it improves security. It will take a lot of effort to hack an iris scan, but it's possible, said Andrew Zonenberg, a senior security consultant at IOActive. It will be difficult for common thieves to break into an iris locked device, he said. "If you're a state-level adversary who can stalk the target for a while, it's unlikely to pose a major barrier -- but at this point, you [the phone owner] probably have bigger problems to worry about," Zonenberg said. The iris is better than fingerprints because you don't leave its imprint on everything you look at, unlike fingerprint traces left behind, Zonenberg said. But research has shown that eye-scanning techniques can be cheated. Spoofing techniques can be used for systems to accept iris scans. To counter that, IARPA (the U.S. Intelligence Advanced Research Projects Activity) will start funding the development of foolproof biometric authentication systems that can detect anyone trying to "disguise their biometric identity." The health issues related to iris scanning are still unknown. But for Samsung executives, they'd rather have the iris scanning feature in Note7 than not, especially in a world where security is becoming a larger concern every day.